A crewman performing a pre-flight inspection of an Air Malta Airbus A320. Aviation safety means the state of an aviation system or organization in which risks associated with aviation activities, related to, or in direct support of the operation of aircraft, are reduced and controlled to an acceptable level. It encompasses the theory, practice, investigation, and categorization of flight failures, and the prevention of such failures through regulation, education, and training. It can also be applied in the context of campaigns that inform the public as to the safety of air travel. Yearly fatalities[a] since 1942, 5-year average in red: fatalities peaked in 1972. In 1926 and 1927 there were a total of 24 fatal commercial airline crashes, a further 16 in 1928, and 51 in 1929 (killing 61 people), which remains the worst year on record at an accident rate of about 1 for every 1,000,000 miles (1,600,000 km) flown. Based on the current numbers flying, this would equate to 7,000 fatal incidents per year. For the ten-year period 2002 to 2011, 0.6 fatal accidents happened per one million flights globally, 0.4 per million hours flown, 22.0 fatalities per one million flights or 12.7 per million hours flown. From 310 million passengers in 1970, air transport had grown to 3,696 million in 2016, led by 823 million in the United States then 488 million in China. In 2016, there were 19 fatal accidents of civil airliners of more than 14 passengers, resulting in 325 fatalities : the second safest year ever after 2015 with 16 accidents and 2013 with 265 fatalities. For planes heavier than 5.7 t, there were 34.9 million departures and 75 accidents worldwide with 7 of these fatal for 182 fatalities, the lowest since 2013 : 5.21 fatalities per million departures. In 2017 there were 10 fatal airliner accidents, resulting in 44 occupant fatalities and 35 persons on the ground: the safest year ever for commercial aviation, both by the number of fatal accidents as well as in fatalities. By 2018, fatal accidents per million flights decreased 16 fold since 1970, from 6.35 to 0.39, and fatalities per trillion revenue passenger kilometre (RPK) decreased 54 fold from 3,218 to 59. Runway safety represents 36% of accidents, Ground Safety 18% and Loss of Control in-Flight 16%. The main cause is Pilot in Command error. Safety has improved from better aircraft design process, engineering and maintenance, the evolution of navigation aids, and safety protocols and procedures. There are three main ways in which risk of fatality of a certain mode of travel can be measured: Deaths per billion typical journeys taken, deaths per billion hours traveled, or deaths per billion kilometers traveled. The following table displays these statistics for the United Kingdom 1990–2000. Note that aviation safety does not include the transportation to the airport. The first two statistics are computed for typical travels for respective forms of transport, so they cannot be used directly to compare risks related to different forms of transport in a particular travel "from A to B". For example: according to statistics, a typical flight from Los Angeles to New York will carry a larger risk factor than a typical car travel from home to office. But a car travel from Los Angeles to New York would not be typical. It would be as large as several dozens of typical car travels, and associated risk will be larger as well. Because the journey would take a much longer time, the overall risk associated by making this journey by car will be higher than making the same journey by air, even if each individual hour of car travel can be less risky than an hour of flight. It is therefore important to use each statistic in a proper context. When it comes to a question about risks associated with a particular long-range travel from one city to another, the most suitable statistic is the third one, thus giving a reason to name air travel as the safest form of long-range transportation. However, if the availability of an air option makes an otherwise inconvenient journey possible, then this argument loses some of its force. Aviation industry insurers base their calculations on the deaths per journey statistic while the aviation industry itself generally uses the deaths per kilometre statistic in press releases. Since 1997 the number of fatal air accidents has been no more than 1 for every 2,000,000,000 person-miles flown (e.g., 100 people flying a plane for 1,000 miles (1,600 km) counts as 100,000 person-miles, making it comparable with methods of transportation with different numbers of passengers, such as one person driving an automobile for 100,000 miles (160,000 km), which is also 100,000 person-miles), and thus one of the safest modes of transportation when measured by distance traveled. The death per billion hours when skydiving assume a 6 minutes skydive (not accounting for the plane ascent). The death per billion journey when paragliding assume an average flight of 15 minutes, so 4 flights per hour. Between 1990 and 2015, there were 1874 commuter and air taxi accidents in the U.S. of which 454 (24%) were fatal, resulting in 1296 deaths, including 674 accidents (36%) and 279 fatalities (22%) in Alaska alone. The number of deaths per passenger-mile on commercial airlines in the United States between 2000 and 2010 was about 0.2 deaths per 10 billion passenger-miles. For driving, the rate was 150 per 10 billion vehicle-miles for 2000 : 750 times higher per mile than for flying in a commercial airplane. There were no fatalities on large scheduled commercial airlines in the United States for over nine years, between the Colgan Air Flight 3407 crash in February 2009, and a catastrophic engine failure on Southwest Airlines Flight 1380 in April 2018. Another aspect of safety is protection from intentional harm or property damage, also known as security. The terrorist attacks of 2001 are not counted as accidents. However, even if they were counted as accidents they would have added about 2 deaths per 2,000,000,000 person-miles. Two months later, American Airlines Flight 587 crashed in New York City, killing 256 people including 5 on the ground, causing 2001 to show a very high fatality rate. Even so, the rate that year including the attacks (estimated here to be about 4 deaths per 1,000,000,000 person-miles), is safe compared to some other forms of transport when measured by distance traveled. The first aircraft electrical or electronic device avionics system was Lawrence Sperry’s autopilot, demonstrated in June 1914. The Transcontinental Airway System chain of beacons was built by the Commerce Department in 1923 to guide airmail flights. Gyrocopters were developed by Juan de la Cierva to avoid stall and spin accidents, and for that invented cyclic and collective controls used by helicopters. It first flew on 17 January 1923. During the 1920s, the first laws were passed in the USA to regulate civil aviation, notably the Air Commerce Act of 1926 which required pilots and aircraft to be examined and licensed, for accidents to be properly investigated, and for the establishment of safety rules and navigation aids, under the Aeronautics Branch of the United States Department of Commerce. One of the first aids for air navigation to be introduced in the USA in the late 1920s was airfield lighting to assist pilots to make landings in poor weather or after dark. The Precision Approach Path Indicator was developed from this in the 1930s, indicating to the pilot the angle of descent to the airfield. This later became adopted internationally through the standards of the International Civil Aviation Organization (ICAO). Jimmy Doolittle developed Instrument rating and made his first “blind” flight in September 1929. The March 1931 wooden wing failure of a Transcontinental & Western Air Fokker F-10 carrying Knute Rockne, coach of the University of Notre Dame’s football team, reinforced all-metal airframes and led to a more formal accident investigation system. On Sept. 4, 1933, a Douglas DC-1 test flight was conducted with one of the two engines shut down during the takeoff run, climbed to 8,000 feet (2,400 m), and completed its flight, proving twin aircraft engine safety. With greater range than lights and weather immunity, radio navigation aids were first used in the 1930s, like the Australian Aeradio stations guiding transport flights, with a light beacon and a modified Lorenz beam transmitter (the German blind-landing equipment preceding the modern instrument landing system - ILS). ILS was first used by a scheduled flight to make a landing in a snowstorm at Pittsburgh, Pennsylvania, in 1938, and a form of ILS was adopted by the ICAO for international use in 1949. Hard runways were built worldwide for World War II to avoid waves and floating hazards plaguing seaplanes. Developed by the U.S. and introduced during World War II, LORAN replaced the sailors' less reliable compass and celestial navigation over water and survived until it was replaced by the Global Positioning System. An airborne pulse-Doppler radar antenna. Some airborne radars can be used as meteorological radars. Following the development of Radar in World War II, it was deployed as a landing aid for civil aviation in the form of ground-controlled approach (GCA) systems then as the airport surveillance radar as an aid to air traffic control in the 1950s. A number of ground-based Weather radar systems can detect areas of severe turbulence. A modern Honeywell Intuvue weather system visualizes weather patterns up to 300 miles (480 km) away. Distance measuring equipment (DME) in 1948 and VHF omnidirectional range (VOR) stations became the main route navigation means during the 1960s, superseding the low frequency radio ranges and the non-directional beacon (NDB): the ground-based VOR stations were often co-located with DME transmitters and the pilots could establish their bearing and distance to the station. With the arrival of Wide Area Augmentation System (WAAS), satellite navigation has become accurate enough for altitude as well as positioning use, and is being used increasingly for instrument approaches as well as en-route navigation. However, because the GPS constellation is a single point of failure, on-board Inertial Navigation System (INS) or ground-based navigation aids are still required for backup. Rockwell Collins reports it costs more to certify than to develop a system, from 75% engineering and 25% certification in past years. It calls for a global harmonization between certifying authorities to avoid redundant engineering and certification tests rather than recognizing the others approval and validation. Groundings of entire classes of aircraft out of equipment safety concerns is unusual, but this has occurred to the de Havilland Comet in 1954 after multiple crashes due to metal fatigue and hull failure, the McDonnell Douglas DC-10 in 1979 after the crash of American Airlines Flight 191 due to engine loss, the Boeing 787 Dreamliner in 2013 after its battery problems, and the Boeing 737 MAX in 2019 after two crashes preliminarily tied to a flight control system. Foreign object debris (FOD) includes items left in the aircraft structure during manufacture/repairs, debris on the runway and solids encountered in flight (e.g. hail and dust). Such items can damage engines and other parts of the aircraft. Air France Flight 4590 crashed after hitting a part that had fallen from another aircraft. A pilot misinformed by a printed document (manual, map, etc. ), reacting to a faulty instrument or indicator (in the cockpit or on the ground), or following inaccurate instructions or information from flight or ground control can lose spatial orientation, or make another mistake, and consequently lead to accidents or near misses. Boeing studies showed that airliners are struck by lightning twice per year on average; aircraft withstand typical lightning strikes without damage. The dangers of more powerful positive lightning were not understood until the destruction of a glider in 1999. It has since been suggested that positive lightning might have caused the crash of Pan Am Flight 214 in 1963. At that time, aircraft were not designed to withstand such strikes because their existence was unknown. The 1985 standard in force in the US at the time of the glider crash, Advisory Circular AC 20-53A, was replaced by Advisory Circular AC 20-53B in 2006. However, it is unclear whether adequate protection against positive lightning was incorporated. The effects of typical lightning on traditional metal-covered aircraft are well understood and serious damage from a lightning strike on an airplane is rare. The Boeing 787 Dreamliner of which the exterior is carbon-fiber-reinforced polymer received no damage from a lightning strike during testing. Snow building on the intake to a Rolls-Royce RB211 engine of a Boeing 747-400. Snow and ice present unique threats, and aircraft operating in these weather conditions often require de-icing equipment. Ice and snow can be major factors in airline accidents. In 2005, Southwest Airlines Flight 1248 slid off the end of a runway after landing in heavy snow conditions, killing one child on the ground. Even a small amount of icing or coarse frost can greatly impair the ability of a wing to develop adequate lift, which is why regulations prohibit ice, snow or even frost on the wings or tail, prior to takeoff. Air Florida Flight 90 crashed on takeoff in 1982, as a result of ice/snow on its wings. An accumulation of ice during flight can be catastrophic, as evidenced by the loss of control and subsequent crashes of American Eagle Flight 4184 in 1994, and Comair Flight 3272 in 1997. Both aircraft were turboprop airliners, with straight wings, which tend to be more susceptible to inflight ice accumulation, than are swept-wing jet airliners. Airlines and airports ensure that aircraft are properly de-iced before takeoff whenever the weather involves icing conditions. Modern airliners are designed to prevent ice buildup on wings, engines, and tails (empennage) by either routing heated air from jet engines through the leading edges of the wing, and inlets, or on slower aircraft, by use of inflatable rubber "boots" that expand to break off any accumulated ice. Airline flight plans require airline dispatch offices to monitor the progress of weather along the routes of their flights, helping the pilots to avoid the worst of inflight icing conditions. Aircraft can also be equipped with an ice detector in order to warn pilots to leave unexpected ice accumulation areas, before the situation becomes critical. Pitot tubes in modern airplanes and helicopters have been provided with the function of "Pitot Heating" to prevent accidents like Air France Flight 447 caused by the pitot tube freezing and giving false readings. Effect of wind shear on aircraft trajectory. Note how merely correcting for the initial gust front can have dire consequences. A wind shear is a change in wind speed and/or direction over a relatively short distance in the atmosphere. A microburst is a localized column of sinking air that drops down in a thunderstorm. Both of these are potential weather threats that may cause an aviation accident. Wreckage of Delta Air Lines Flight 191 tail section after a microburst slammed the aircraft into the ground. Strong outflow from thunderstorms causes rapid changes in the three-dimensional wind velocity just above ground level. Initially, this outflow causes a headwind that increases airspeed, which normally causes a pilot to reduce engine power if they are unaware of the wind shear. As the aircraft passes into the region of the downdraft, the localized headwind diminishes, reducing the aircraft's airspeed and increasing its sink rate. Then, when the aircraft passes through the other side of the downdraft, the headwind becomes a tailwind, reducing lift generated by the wings, and leaving the aircraft in a low-power, low-speed descent. This can lead to an accident if the aircraft is too low to effect a recovery before ground contact. Between 1964 and 1985, wind shear directly caused or contributed to 26 major civil transport aircraft accidents in the U.S. that led to 620 deaths and 200 injuries. An engine may fail to function because of fuel starvation (e.g. British Airways Flight 38), fuel exhaustion (e.g. Air Canada Flight 143), foreign object damage (e.g. US Airways Flight 1549), mechanical failure due to metal fatigue (e.g. Kegworth air disaster, El Al Flight 1862, China Airlines Flight 358), mechanical failure due to improper maintenance (e.g. American Airlines Flight 191), mechanical failure caused by an original manufacturing defect in the engine (e.g. Qantas Flight 32, United Airlines Flight 232, Delta Air Lines Flight 1288), and pilot error (e.g. Pinnacle Airlines Flight 3701). In a multi-engine aircraft, failure of a single engine usually results in a precautionary landing being performed, for example landing at a diversion airport instead of continuing to the intended destination. Failure of a second engine (e.g. US Airways Flight 1549) or damage to other aircraft systems caused by an uncontained engine failure (e.g. United Airlines Flight 232) may, if an emergency landing is not possible, result in the aircraft crashing. Examples of failure of aircraft structures caused by metal fatigue include the de Havilland Comet accidents (1950s) and Aloha Airlines Flight 243 (1988). Improper repair procedures can also cause structural failures include Japan Airlines Flight 123 (1985) and China Airlines Flight 611 (2002). Now that the subject is better understood, rigorous inspection and nondestructive testing procedures are in place. Composite materials consist of layers of fibers embedded in a resin matrix. In some cases, especially when subjected to cyclic stress, the layers of the material separate from each other (delaminate) and lose strength. As the failure develops inside the material, nothing is shown on the surface; instrument methods (often ultrasound-based) have to be used to detect such a material failure. In the 1940s several Yakovlev Yak-9s experienced delamination of plywood in their construction. Stalling an aircraft (increasing the angle of attack to a point at which the wings fail to produce enough lift) is dangerous and can result in a crash if the pilot fails to make a timely correction. Devices to warn the pilot when the aircraft's speed is decreasing close to the stall speed include stall warning horns (now standard on virtually all powered aircraft), stick shakers, and voice warnings. Most stalls are a result of the pilot allowing the airspeed to be too slow for the particular weight and configuration at the time. Stall speed is higher when ice or frost has attached to the wings and/or tail stabilizer. The more severe the icing, the higher the stall speed, not only because smooth airflow over the wings becomes increasingly more difficult, but also because of the added weight of the accumulated ice. Safety regulations control aircraft materials and the requirements for automated fire safety systems. Usually these requirements take the form of required tests. The tests measure flammability of materials and toxicity of smoke. When the tests fail, it is on a prototype in an engineering laboratory rather than in an aircraft. Fire and its toxic smoke have been the cause of accidents. An electrical fire on Air Canada Flight 797 in 1983 caused the deaths of 23 of the 46 passengers, resulting in the introduction of floor level lighting to assist people to evacuate a smoke-filled aircraft. In 1985, a fire on the runway caused the loss of 55 lives, 48 from the effects of incapacitating and subsequently lethal toxic gas and smoke in the British Airtours Flight 28M accident which raised serious concerns relating to survivability – something that had not been studied in such detail. The swift incursion of the fire into the fuselage and the layout of the aircraft impaired passengers' ability to evacuate, with areas such as the forward galley area becoming a bottle-neck for escaping passengers, with some dying very close to the exits. Much research into evacuation and cabin and seating layouts was carried out at Cranfield Institute to try to measure what makes a good evacuation route, which led to the seat layout by Overwing exits being changed by mandate and the examination of evacuation requirements relating to the design of galley areas. The use of smoke hoods or misting systems were also examined although both were rejected. South African Airways Flight 295 was lost in the Indian Ocean in 1987 after an in-flight fire in the cargo hold could not be suppressed by the crew. The cargo holds of most airliners are now equipped with automated halon fire extinguishing systems to combat a fire that might occur in the baggage holds. In May 1996, ValuJet Flight 592 crashed into the Florida Everglades a few minutes after takeoff because of a fire in the forward cargo hold. All 110 people on board were killed. 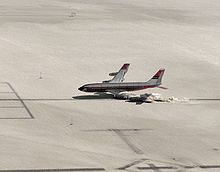 At one time, fire fighting foam paths were laid down before an emergency landing, but the practice was considered only marginally effective, and concerns about the depletion of fire fighting capability due to pre-foaming led the United States FAA to withdraw its recommendation in 1987. One possible cause of fires in airplanes is wiring problems that involve intermittent faults, such as wires with breached insulation touching each other, having water dripping on them, or short circuits. Notable was Swissair Flight 111 in 1998 due to an arc in the wiring of IFE which ignite flammable MPET insulation. These are difficult to detect once the aircraft is on the ground. However, there are methods, such as spread-spectrum time-domain reflectometry, that can feasibly test live wires on aircraft during flight. Bird strike is an aviation term for a collision between a bird and an aircraft. Fatal accidents have been caused by both engine failure following bird ingestion and bird strikes breaking cockpit windshields. Jet engines have to be designed to withstand the ingestion of birds of a specified weight and number and to not lose more than a specified amount of thrust. The weight and numbers of birds that can be ingested without hazarding the safe flight of the aircraft are related to the engine intake area. The hazards of ingesting birds beyond the "designed-for" limit were shown on US Airways Flight 1549 when the aircraft struck Canada geese. The highest risk of a bird strike occurs during takeoff and landing in the vicinity of airports, and during low-level flying, for example by military aircraft, crop dusters and helicopters. Some airports use active countermeasures, including a person with a shotgun, playing recorded sounds of predators through loudspeakers, or employing falconers. Poisonous grass can be planted that is not palatable to birds, nor to insects that attract insectivorous birds. Passive countermeasures involve sensible[clarification needed] land-use management, avoiding conditions attracting flocks of birds to the area (e.g. landfills). Another tactic found effective is to let the grass at the airfield grow taller (to approximately 12 inches or 30 centimetres) as some species of birds won't land if they cannot see one another. NASA air safety experiment (CID project). The airplane is a Boeing 720 testing a form of jet fuel, known as "antimisting kerosene", which formed a difficult-to-ignite gel when agitated violently, as in a crash. Human factors, including pilot error, are another potential set of factors, and currently the factor most commonly found in aviation accidents. Much progress in applying human factors analysis to improving aviation safety was made around the time of World War II by such pioneers as Paul Fitts and Alphonse Chapanis. However, there has been progress in safety throughout the history of aviation, such as the development of the pilot's checklist in 1937. CRM, or Crew Resource Management, is a technique that makes use of the experience and knowledge of the complete flight crew to avoid dependence on just one crew member. Pilot error and improper communication are often factors in the collision of aircraft. This can take place in the air (1978 Pacific Southwest Airlines Flight 182) (TCAS) or on the ground (1977 Tenerife disaster) (RAAS). The barriers to effective communication have internal and external factors. The ability of the flight crew to maintain situation awareness is a critical human factor in air safety. Human factors training is available to general aviation pilots and called single pilot resource management training. Failure of the pilots to properly monitor the flight instruments caused the crash of Eastern Air Lines Flight 401 in 1972. Controlled flight into terrain (CFIT), and error during take-off and landing can have catastrophic consequences, for example causing the crash of Prinair Flight 191 on landing, also in 1972. The International Civil Aviation Organization (ICAO) defines fatigue as "A physiological state of reduced mental or physical performance capability resulting from sleep loss or extended wakefulness, circadian phase, or workload." The phenomenon places great risk on the crew and passengers of an airplane because it significantly increases the chance of pilot error. Fatigue is particularly prevalent among pilots because of "unpredictable work hours, long duty periods, circadian disruption, and insufficient sleep". These factors can occur together to produce a combination of sleep deprivation, circadian rhythm effects, and 'time-on task' fatigue. Regulators attempt to mitigate fatigue by limiting the number of hours pilots are allowed to fly over varying periods of time. Experts in aviation fatigue[who?] often find that these methods fall short of their goals. Rarely, flight crew members are arrested or subject to disciplinary action for being intoxicated on the job. In 1990, three Northwest Airlines crew members were sentenced to jail for flying while drunk. In 2001, Northwest fired a pilot who failed a breathalyzer test after a flight. In July 2002, both pilots of America West Airlines Flight 556 were arrested just before they were scheduled to fly because they had been drinking alcohol. The pilots were fired and the FAA revoked their pilot licenses. At least one fatal airliner accident involving drunk pilots occurred when Aero Flight 311 crashed at Koivulahti, Finland, killing all 25 on board in 1961, which underscores the role that poor human choices can play in air accidents. Human factors incidents are not limited to errors by pilots. Failure to close a cargo door properly on Turkish Airlines Flight 981 in 1974 caused the loss of the aircraft – however, design of the cargo door latch was also a major factor in the accident. In the case of Japan Airlines Flight 123 in 1985, improper repair of previous damage led to explosive decompression of the cabin, which in turn destroyed the vertical stabilizer and damaged all four hydraulic systems which powered all the flight controls. Controlled flight into terrain (CFIT) is a class of accidents in which an aircraft is flown under control into terrain or man-made structures. CFIT accidents typically result from pilot error or of navigational system error. Failure to protect ILS critical areas can also cause CFIT accidents[dubious – discuss]. In December 1995, American Airlines Flight 965 tracked off course while approaching Cali, Colombia and hit a mountainside despite a terrain awareness and warning system (TAWS) terrain warning in the cockpit and desperate pilot attempt to gain altitude after the warning. Crew position awareness and monitoring of navigational systems are essential to the prevention of CFIT accidents. As of February 2008[update], over 40,000 aircraft had enhanced TAWS installed, and they had flown over 800 million hours without a CFIT accident. Another anti-CFIT tool is the Minimum Safe Altitude Warning (MSAW) system which monitors the altitudes transmitted by aircraft transponders and compares that with the system's defined minimum safe altitudes for a given area. When the system determines the aircraft is lower, or might soon be lower, than the minimum safe altitude, the air traffic controller receives an acoustic and visual warning and then alerts the pilot that the aircraft is too low. The use of certain electronic equipment is partially or entirely prohibited as it might interfere with aircraft operation, such as causing compass deviations. Use of some types of personal electronic devices is prohibited when an aircraft is below 10,000 feet (3,000 m), taking off, or landing. Use of a mobile phone is prohibited on most flights because in-flight usage creates problems with ground-based cells. Various ground support equipment operate in close proximity to the fuselage and wings to service the aircraft and occasionally cause accidental damage in the form of scratches in the paint or small dents in the skin. However, because aircraft structures (including the outer skin) play such a critical role in the safe operation of a flight, all damage is inspected, measured, and possibly tested to ensure that any damage is within safe tolerances. An example problem was the depressurization incident on Alaska Airlines Flight 536 in 2005. During ground services a baggage handler hit the side of the aircraft with a tug towing a train of baggage carts. This damaged the metal skin of the aircraft. This damage was not reported and the plane departed. Climbing through 26,000 feet (7,900 m) the damaged section of the skin gave way under the difference in pressure between the inside of the aircraft and the outside air. The cabin depressurized explosively necessitating a rapid descent to denser (breathable) air and an emergency landing. Post-landing examination of the fuselage revealed a 12-inch (30 cm) hole on the right side of the airplane. Plumes of volcanic ash near active volcanoes can damage propellers, engines and cockpit windows. In 1982, British Airways Flight 9 flew through an ash cloud and temporarily lost power from all four engines. The plane was badly damaged, with all the leading edges being scratched. The front windscreens had been so badly "sand" blasted by the ash that they could not be used to land the aircraft. Prior to 2010 the general approach taken by airspace regulators was that if the ash concentration rose above zero, then the airspace was considered unsafe and was consequently closed. Volcanic Ash Advisory Centers enable liaison between meteorologists, volcanologists, and the aviation industry. Runway excursion – an incident involving only a single aircraft making an inappropriate exit from the runway. Runway overrun – a specific type of excursion where the aircraft does not stop before the end of the runway (e.g., Air France Flight 358). Runway incursion – incorrect presence of a vehicle, person, or another aircraft on the runway (e.g., Tenerife airport disaster). Runway confusion – crew misidentification the runway for landing or take-off (e.g., Comair Flight 191, Singapore Airlines Flight 6). Aircrew are normally trained to handle hijack situations. Since the September 11, 2001 attacks, stricter airport and airline security measures are in place to prevent terrorism, such as security checkpoints and locking the cockpit doors during flight. In the United States, the Federal Flight Deck Officer program is run by the Federal Air Marshal Service, with the aim of training active and licensed airline pilots to carry weapons and defend their aircraft against criminal activity and terrorism. Upon completion of government training, selected pilots enter a covert law enforcement and counter-terrorism service. Their jurisdiction is normally limited to a flight deck or a cabin of a commercial airliner or a cargo aircraft they operate while on duty. Although most air crews are screened for psychological fitness, some have taken suicidal actions. In the case of EgyptAir Flight 990, it appears that the first officer deliberately crashed into the Atlantic Ocean while the captain was away from his station in 1999 off Nantucket, Massachusetts. In 1982, Japan Airlines Flight 350 crashed while on approach to the Tokyo Haneda Airport, killing 24 of the 174 on board. The official investigation found the mentally ill captain had attempted suicide by placing the inboard engines into reverse thrust, while the aircraft was close to the runway. The first officer did not have enough time to countermand before the aircraft stalled and crashed. In 1997, SilkAir Flight 185 suddenly went into a high dive from its cruising altitude. The speed of the dive was so high that the aircraft began to break apart before it finally crashed near Palembang, Sumatra. After three years of investigation, the Indonesian authorities declared that the cause of the accident could not be determined. However, the US NTSB concluded that deliberate suicide by the captain was the only reasonable explanation. In 2015, on March 24, Germanwings Flight 9525 (an Airbus A320-200) crashed 100 kilometres (62 mi) northwest of Nice, in the French Alps, after a constant descent that began one minute after the last routine contact with air traffic control and shortly after the aircraft had reached its assigned cruise altitude. All 144 passengers and six crew members were killed. The crash was intentionally caused by the co-pilot, Andreas Lubitz. Having been declared "unfit to work" without telling his employer, Lubitz reported for duty, and during the flight locked the pilot out of the cabin. In response to the incident and the circumstances of Lubitz's involvement, aviation authorities in Canada, New Zealand, Germany and Australia implemented new regulations that require two authorized personnel to be present in the cockpit at all times. Three days after the incident the European Aviation Safety Agency issued a temporary recommendation for airlines to ensure that at least two crew members, including at least one pilot, are in the cockpit at all times of the flight. Several airlines announced they had already adopted similar policies voluntarily. In 1955, Bulgaria shot down El Al Flight 402. In 1973, Israel shot down Libyan Arab Airlines Flight 114. In 1983, the Soviet Union shot down Korean Air Lines Flight 007. In 1988, the United States shot down Iran Air Flight 655. In 2001, the Ukrainian Air Force accidentally shot down Siberia Airlines Flight 1812 during an exercise. In 2014, a Russian Aerospace Defense Forces Buk missile system shot down Malaysia Airlines Flight 17 . Earlier tragedies investigations and improved engineering has allowed many safety improvements that have allowed an increasing safer aviation. Airport design and location can have a large impact on aviation safety, especially since some airports such as Chicago Midway International Airport were originally built for propeller planes and many airports are in congested areas where it is difficult to meet newer safety standards. For instance, the FAA issued rules in 1999 calling for a runway safety area, usually extending 500 feet (150 m) to each side and 1,000 feet (300 m) beyond the end of a runway. This is intended to cover ninety percent of the cases of an aircraft leaving the runway by providing a buffer space free of obstacles. Many older airports do not meet this standard. One method of substituting for the 1,000 feet (300 m) at the end of a runway for airports in congested areas is to install an engineered materials arrestor system (EMAS). These systems are usually made of a lightweight, crushable concrete that absorbs the energy of the aircraft to bring it to a rapid stop. As of 2008[update], they have stopped three aircraft at JFK Airport. According to a 2000 report by the National Transportation Safety Board, emergency aircraft evacuations happen about once every 11 days in the U.S. While some situations are extremely dire, such as when the plane is on fire, in many cases the greatest challenge for passengers can be the use of the evacuation slide. In a Time article on the subject, Amanda Ripley reported that when a new supersized Airbus A380 underwent mandatory evacuation tests in 2006, thirty-three of the 873 evacuating volunteers got hurt. While the evacuation was considered a success, one volunteer suffered a broken leg, while the remaining 32 received slide burns. Such accidents are common. In her article, Ripley provided tips on how to make it down the airplane slide without injury. Another improvement to airplane evacuations is the requirement by the Federal Aviation Administration for planes to demonstrate an evacuation time of 90 seconds with half the emergency exits blocked for each type of airplane in their fleet. According to studies, 90 seconds is the time needed to evacuate before the plane starts burning, before there can be a very large fire or explosions, or before fumes fill the cabin. Changes such as using new materials for seat fabric and insulation has given between 40 and 60 additional seconds to people on board to evacuate before the cabin gets filled with fire and potential deadly fumes. Other improvements through the years include the use of properly rated seatbelts, impact resistant seat frames, and airplane wings and engines designed to shear off to absorb impact forces. As the result of the accidents due to wind shear and other weather disturbances, most notably the 1985 crash of Delta Air Lines Flight 191, the U.S. Federal Aviation Administration mandated that all commercial aircraft have on-board wind shear detection systems by 1993. Since 1995, the number of major civil aircraft accidents caused by wind shear has dropped to approximately one every ten years, due to the mandated on-board detection as well as the addition of Doppler weather radar units on the ground (NEXRAD). The installation of high-resolution Terminal Doppler Weather Radar stations at many U.S. airports that are commonly affected by wind shear has further aided the ability of pilots and ground controllers to avoid wind shear conditions. Air safety investigators are trained and authorized to investigate aviation accidents and incidents: to research, analyse, and report their conclusions. They may be specialized in aircraft structures, air traffic control, flight recorders or human factors. They can be employed by government organizations responsible for aviation safety, manufacturers or unions. Commercial Aviation Safety Team (CAST) in the US. The Commercial Aviation Safety Team (CAST) was founded in 1998 with a goal to reduce the commercial aviation fatality rate in the United States by 80 percent by 2007. European Strategic Safety Initiative (ESSI) . The European Strategic Safety Initiative (ESSI) is an aviation safety partnership between EASA, other regulators and the industry. The initiative objective is to further enhance safety for citizens in Europe and worldwide through safety analysis, implementation of cost effective action plans, and coordination with other safety initiatives worldwide. After the disappearance of Malaysia Airlines Flight 370, in June 2014, the International Air Transport Association said it was working on implementing new measures to track aircraft in flight in real time. A special panel was considering a range of options including the production of equipment especially designed to ensure real-time tracking. Since pilot error accounts for between one-third and 60% of aviation accidents, advances in automation and technology could replace some or all of the duties of the aircraft pilots. Automation since the 1980s has already eliminated the need for flight engineers. In complex situations with severely degraded systems, the problem-solving and judgement capability of humans is challenging to achieve with automated systems, for example the catastrophic engine failures experienced by United Airlines Flight 232 and Qantas Flight 32. However, with more accurate software modeling of aeronautic factors, test planes have been successfully flown in these conditions. While the accident rate is very low, to ensure they do not rise with the air transport growth, experts recommend creating a robust culture of collecting information from employees without blame. ^ "Preliminary ASN data show 2016 to be one of the safest years in aviation history". Aviation Safety Network. Flight Safety Foundation. 29 December 2016. ^ "ASN data show 2017 was safest year in aviation history". Aviation Safety Network. Flight Safety Foundation. 30 December 2017. ^ Javier Irastorza Mediavilla (Jan 2, 2019). "Aviation safety evolution (2018 update)". ^ The risks of travel Archived September 7, 2001, at the Wayback Machine. The site cites the source as an October 2000 article by Roger Ford in the magazine Modern Railways and based on a DETR survey. ^ Beck, L. F.; Dellinger, A. M.; O'neil, M. E. (2007). "Motor vehicle crash injury rates by mode of travel, United States: using exposure-based methods to quantify differences". American Journal of Epidemiology. 166 (2): 212–218. doi:10.1093/aje/kwm064. ^ "Rapport 2012 sur les chiffres de l'accidentologie du parapente" (PDF) (in French). FFVL. 15 Nov 2012. ^ "Incidents And Accidents". USPA. 11 Oct 2008. ^ "How long does a skydive last". 19 Apr 2017. ^ "Space Shuttle Era Facts" (PDF). NASA. 2011. ^ "Flight into danger – 07 August 1999 – New Scientist Space". Retrieved 21 March 2018. ^ "How long is your average flight?". 2006. ^ "Aviation Safety Research Program". United States National Institute for Occupational Safety and Health. October 22, 2018. ^ "Fatalities". Bureau of Transportation Statistics. ^ "U.S. Passenger miles". Bureau of Transportation Statistics. ^ a b c d "A Short History Of Making Flying Safer". Aviation Week & Space Technology. Aug 1, 2017. ^ John Croft (Apr 7, 2017). "What Is The Certification Tipping Point?". Aviation Week & Space Technology. ^ Kent Statler, Rockwell Collins (Nov 1, 2017). "Opinion: World Needs Seamless Aviation Certification Standards". Aviation Week & Space Technology. ^ Blumenkrantz, Zohar (June 15, 2009). "Two planes nearly crash at Ben Gurion Airport due to glitch". Haaretz. ^ "Momento24.com". momento24.com. Retrieved 21 March 2018. ^ Gulezian, Lisa Amin. "NTSB, FAA investigate near-miss mid-air collision at San Francisco International Airport". ABC7 San Francisco. Retrieved 21 March 2018. ^ Wald, Matthew L. (20 July 2007). "La Guardia Near-Crash Is One of a Rising Number". Retrieved 21 March 2018 – via NYTimes.com. ^ a b "Schleicher ASK 21 two seat glider, 17 April 1999 - GOV.UK". Retrieved 21 March 2018. ^ "FAA Advisory Circulars". Retrieved 21 March 2018. ^ A Proposed Addition to the Lightning Environment Standards Applicable to Aircraft. J. Anderson Plumer. Lightning Technologies, Inc. published 2005-09-27. ^ "Comair EMB-120, Unheeded Warning, ATR-72 Icing, airline icing accidents, FAA, AMR 4184, Loss of control accidents, Turboprop airliners". www.airlinesafety.com. Retrieved 21 March 2018. ^ a b c d Yan, Holly (2 August 2018). "'I fell from the sky and survived.' Passengers aboard Aeromexico flight recount fiery crash". CNN. Retrieved August 2, 2018. ^ a b National Aeronautics and Space Administration, Langley Research Center (June 1992). "Making the Skies Safer From Windshear". Archived from the original on March 29, 2010. Retrieved 2012-11-16. ^ Smith, Paul; Cynthia Furse & Jacob Gunther (Dec 2005). "Analysis of Spread Spectrum Time Domain Reflectometry for Wire Fault Location". IEEE Sensors Journal. 5 (6). Archived from the original on 2010-05-01. ^ Baron, Robert (2014). "Barriers to Effective Communication: Implications for the Cockpit". airline safety.com. The Aviation Consulting Group. Retrieved October 7, 2015. ^ Caldwell, John; Mallis, Melissa (January 2009). "Fatigue Countermeasures in Aviation". Aviation, Space, and Environmental Medicine. 80 (1): 29–59. doi:10.3357/asem.2435.2009. ^ a b Caldwell, John A.; Mallis, Melissa M.; Caldwell, J. Lynn (January 2009). "Fatigue Countermeasures in Aviation". Aviation, Space, and Environmental Medicine. 80 (1): 29–59. doi:10.3357/asem.2435.2009. ^ "U.S. drops prosecution of allegedly tipsy pilots (second story)". Archived from the original on 2016-03-05. Retrieved 21 March 2018. ^ "CFIT blamed for last year's crash of EGPWS-equipped King Air 200". Retrieved 21 March 2018. ^ "Minimum Safe Altitude Warning (MSAW) - SKYbrary Aviation Safety". www.skybrary.aero. Retrieved 21 March 2018. ^ a b Ladkin, Peter B.; with colleagues (October 20, 1997). "Electromagnetic Interference with Aircraft Systems: why worry?". University of Bielefeld – Faculty of Technology. Retrieved December 24, 2015. ^ Hsu, Jeremy (December 21, 2009). "The Real Reason Cell Phone Use Is Banned on Airlines". livescience.com. Retrieved December 24, 2015. ^ "National Transportation Safety Board – Aviation Accidents: SEA06LA033". National Transportation Safety Board. 2006-08-29. Retrieved 2007-07-14. ^ Program, Volcano Hazards. "USGS: Volcano Hazards Program". volcanoes.usgs.gov. Retrieved 21 March 2018. ^ "Volcanic Ash - SKYbrary Aviation Safety". www.skybrary.aero. Retrieved 21 March 2018. ^ Marks, Paul (20 April 2010). "Can we fly safely through volcanic ash?". New Scientist. Retrieved 2018-04-04. ^ "Volcanic Ash–Danger to Aircraft in the North Pacific, USGS Fact Sheet 030-97". pubs.usgs.gov. Retrieved 21 March 2018. ^ a b c Abend, Les (2 August 2018). "Pilot: How a plane can crash and everyone survives". CNN. Retrieved August 3, 2018. ^ How to Escape Down an Airplane Slide – and Still Make Your Connection! Amanda Ripley. TIME. January 23, 2008. ^ "Terminal Doppler Weather Radar Information". National Weather Service. Retrieved 4 August 2009. ^ Annex 19. Safety Management (PDF). Montreal: ICAO. 2013. p. 44. ISBN 978-92-9249-232-8. ^ "IATA wants new airline tracking equipment". Malaysia Sun. 9 June 2014. ^ Eric Auxier (May 10, 2016). "Robot is My Co-Pilot: What could go wrong?—click! Go Wrong?". Airways international. ^ "Active Home Page". Past Research Projects. NASA. Retrieved June 1, 2006. ^ Jon Beatty, president and CEO of Flight Safety Foundation (Nov 20, 2017). "Opinion: How To Keep Accidents Low As Air Traffic Increases". Aviation Week & Space Technology. This page was last edited on 10 April 2019, at 06:11 (UTC).